This is our second post about Lani's Lana Community Supported Cloth, a climate beneficial wool fabric that recently shipped to everyone who pre-ordered yardage. We—or rather, patternmaker and master sewist Dan DiSanto—are providing some information on how to work with this very special material. In this post, we discuss fabric movement, malleability, and molding, as well as a zipper trick and some biased advice (pun intended). Q: So, Dan. You like the movement in this fabric a lot. Dan: I really do. This fabric is very much alive, very malleable, especially in the twill weave. You don’t need too many seams in it, because you can sculpt all-natural fibers (like wool) by using steam, and by controlling the amount of ease in the seams. Q: Tell us more about what you mean by “sculpting,” especially as compared to synthetics. Dan: Fabric shear tests tell us how much effort the warp and weft yarns have to make in order to slide over each other when pulled on the bias. A loosely woven, lightweight synthetic fabric—like a poly chiffon—has a good shear quality, but most synthetic yarns are so fine and tightly packed together that they have trouble sliding over each other when pulled diagonally. They don't move. Consider the difference between a sheet of paper and rubber band: Synthetics sew more like paper. When you crumple paper up, it doesn’t really relax because there is no spring to it. If you spread crumpled paper onto a tailor’s ham, it’s still crumpled. 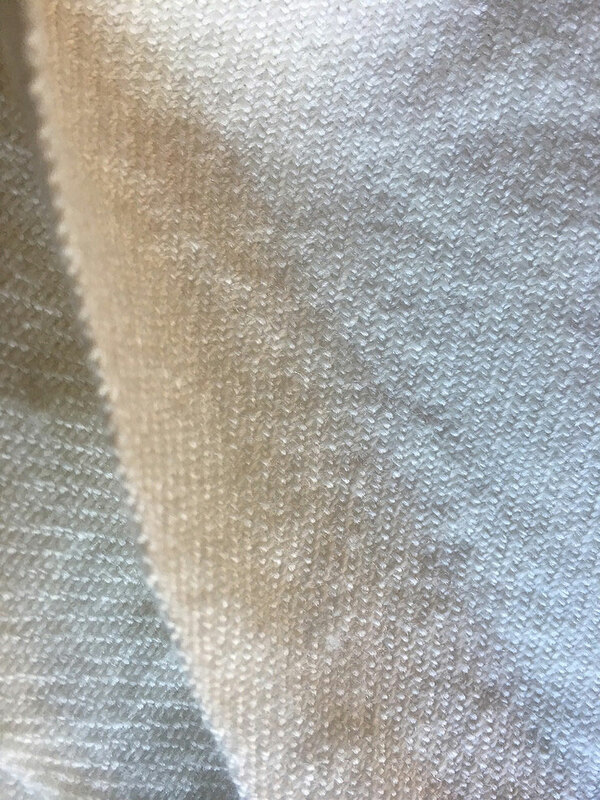 Dan: This fabric has a bit of stretch because of the twill weave and the fact that it’s wool. This fabric is not nearly as stretchy as most knits, but it’s also not as stable as a plain weave. Some stretch is helpful in sewing. If you have stretch you can also have ease, like in a sleeve cap, because you can ease the fibers into each other without pucker. This is why wool is so popular in men’s suiting; that malleability and stretch enable those molded shoulders to be sewn and tailored without puckering. 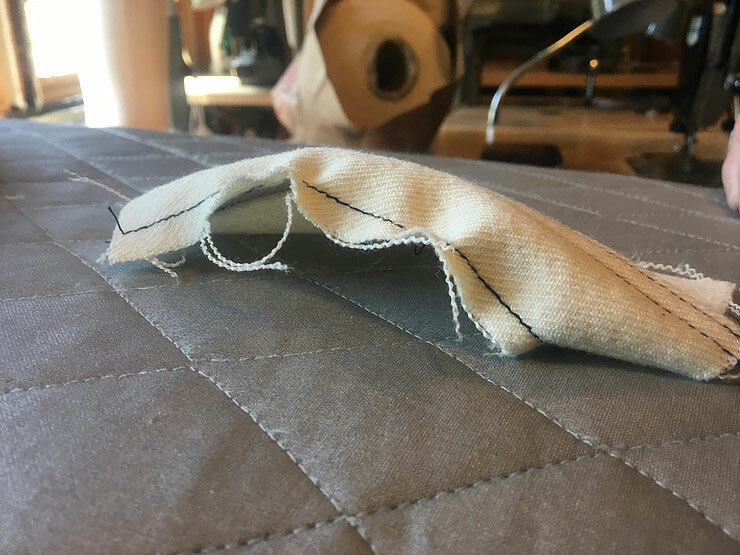 You can overwork and overstretch things, but with this fabric—if a seam is stretched out for example—you can just steam it flat again. You can even give it a little spritz of water and pound it flat with a wooden tailor’s clapper. Pounding wool with a wooden block and some steam is how tailors used to get that razor-sharp edge on suit lapels. Q: Given that stretch and movement, are there times when sewists may want to stabilize the fabric? Dan: When we say “stabilize” in regard to sewing, it means adding something with NO stretch to fabric that has stretch. Look inside some of your ready-to-wear knit items at home, at the inside of a t-shirt neckline, for example. Better T-shirts and sweaters often have the back neckline seam, armholes, and shoulder seams stabilized with a small strip of self tape, a thin piece of twill tape, or even a tiny strip of clear elastic, to prevent the garment from stretching out of shape (both during sewing and wearing). I would make sure to at least stabilize some seams with a stay stitch. That is a small stitch about ⅛” from the seam line, sewn into the seam allowance before the seam is sewn to join the fabrics. It helps hold the yarns of the fabric together. I did this in the neckline and armholes (where bias curves were cut into the fabric), so they did not stretch out when joining the collar or sleeves. It was sufficient. I also did this at the bottom of some curved shirt-tail hems. Just that one small row of stay stitching before turning the hem prevented the narrow hem from stretching out and distorting the curves in the shirt hems. The one thing that can be a bit tricky with this fabric is zipper application, which is another situation in which you try to join the zipper tape having no stretch, to fabric that has stretch. It’s tricky because of the dynamic between twill fabric and sewing machine movement. Knowing when to sew on right side and when to sew on wrong side helps to mitigate this dynamic. Let’s back up and start with the fabric. It’s easy to see what the right side of this fabric is. It’s a right hand twill fabric—the twill goes up and to the right, from the left lower corner up to the right upper corner—so it’s obvious what the right side is. On any sewing machine without a walking foot, there is opposing action between the feed dogs and the presser foot. On the bottom, the feed dogs pull the fabric back. On the top, the presser foot pushes the fabric forward, in the opposite direction of the feed dogs. You can sew in a way that is mindful of this dynamic. Keep the stretchier fabric against the feed dogs, and the more stable fabric on top under the presser foot. The feed dogs pulling back will help ease in the stretchier fabric. This is what I show in this video example. First, I sew with the fabric up against the presser foot, and the zipper tape down. The presser foot pushes the twill fabric and creates a pucker. But when I sew the second side of the zipper, the zipper tape is on top—in contact with the presser foot—and the wool fabric is against the feed dogs. This creates a clean, stable, and pucker-free zipper. Q: Thank you. That is really helpful, especially because zippers can feel tricky enough on their own. Another aspect of movement I want to ask about is drape. What about drape with this fabric? Dan: It’s a medium weight fabric, so it has some drape but the drape is heavier; it’s not the same drape you’ll have with lighter weight fabrics. If you do gathers, they’ll be very “sticky-outy.” This fabric drapes out, not in. An extreme example is bias cut chiffon which falls IN to the body, and this denser fabric would fall away from the body. Gathers on this fabric will be beautiful, but will give more volume than what you might be used to with lighter weight fabrics. Q: Speaking of bias chiffon, what about sewing this wool fabric on the bias? Should you do that with this fabric, given how much implicit movement it already has? Dan: I would avoid cutting this fabric on the bias, not because of anything specific to this fabric, but because it’s hard to do with any twill weave. When you cut and sew a twill weave on the bias, the diagonal weave will end up looking a bit random because of the twill. You also create right and left hang, which is easy to notice when you make a bias-cut garment and try to hem it. One side will hang much differently than the other, because the twill goes only one way. For a hem, then, you might end up taking 3” off the right side and 1.5” on the left to make the garment hem look parallel to the floor. In addition, the fullness won’t look balanced on the bias; the right side may hang differently than the left. This means the fabric may fall into your body more on one side, and away from your body on the other. Let the garment hang at least overnight if you do cut it on the bias, but be prepared to address the uneven hem issues created by the imbalance between the twill weave and the bias.